Elizabeth Alexander’s Praise Song for the Day. St. Paul, Minnesota: Graywolf Press, 2009. 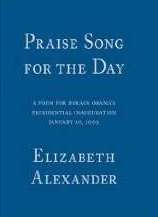 Written for President Barack Obama’s inauguration, “Praise Song for the Day” by poet Elizabeth Alexander is a remembrance of times past, an appreciation for the present, and, to invoke Obama’s phrasing, an affirmation of "hope" for the future. Alexander reminds her audience that the buildings which will become both office and home for Obama were built on the backs of slaves, and those men and women, along with many others in proceeding generations from then until now, have made Obama’s presidency a possibility and now a reality. Thinking of the past, present, and future, Alexander writes the words: “We cross dirt roads and highways that mark / the will of some and then others, who said / I need to see what’s on the other side. / I know there’s something better down the road.” The building of roads mark the progress of our nation from coast to coast and from town to city, but it also reveals the American spirit to strive upward, to rise and rise again. The symbolism is connected with Obama as at one time he could not have even voted in a Presidential election, and now, a Harvard Law graduate and U.S. Senator, he holds the highest office in our country and the most powerful position in the world. This progression leads the audience to appreciate the present while looking with hope to the future when even more barriers will be torn down and love, perhaps “the mightiest word" notes Alexander, will be shown to all citizens of both the United States and the world.